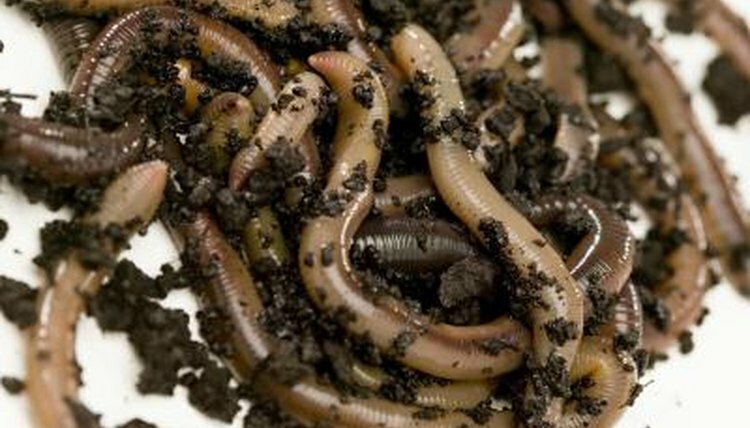 Earthworms consume soil particles that contain protozoa, fungi, bacteria and nematodes. They use their muscular mouths to pull the food into their bodies. The food passes through the esophagus, gizzard and intestines, where it mixes with liquid calcium carbonate. Enzymes and bacteria aid in digesting the food. The beneficial nutrients are absorbed by the blood stream, while the waste, also known as castings, is released into the soil, enriching it with beneficial enzymes and bacteria. The amylase enzyme is present in plants, molds, bacteria and yeasts that earthworms consume. Amylase is an important part of the digestive process due to its ability to break down glycogen, polysaccharides and starch. Amylase is also found in saliva and immediately begins aiding digestion in the mouth of the earthworm. Plants consist of starch, xylan, pectin, galactine and starch; the amylase enzyme is responsible for breaking down these substances. Fats and oils require digestive action before absorption occurs. Lipase in earthworms is the primary digestant that breaks down oils and fats into smaller molecules. It splits fats into fatty acids and glycerol, which the bloodstream then absorbs. The lipase enzyme is also responsible for regulating chemical reactions, ensuring that reactions take place only when the body needs it and during the digestive process. This helps avoid wasting unnecessary energy. It also recycles and breaks down cellular components of membrane constituents. At times, earthworms digest small particles of insects from the soil they feed from, the lipase enzyme aids in the digestion of these ingested particles as well as breaks down fats and oils from the food source. The glycolytic enzyme in the digestive system of the earthworm is responsible for splitting sugars. Glycolysis is the preparatory catabolic pathway; it begins the breakdown and oxidation of glucose. The glycolytic digestive enzyme catalyzes the hydrolysis of glycogen and starch, liberating dextrin, glucose, maltose and matotroise in the digestive tract. The enzyme breaks glucose down into pyruvic and lactic acids. Glycolytic enzymes are essential to the earthworms' digestive systems and processes. Proteolytic enzymes aid in the digestion of proteins. Proteolytic enzymes are localized in the earthworms' alimentary canals. They play an important role in earthworms' alimentary digestion by breaking down proteins, allowing the earthworms to properly absorb nutrients. In a compost pile, earthworms get protein sources from the scraps of vegetation in the pile. The protease makes earthworms capable of naturally decomposing items such as egg shells, potato peels, fruits, vegetables and more. Indian Journal of Biotechnology: Comparative Studies on the Digestive Enzymes in the Gut of Earthworms. Research Gate: An Enzyme From the Earthworm Eisenia Fetida Is Not Only a Protease but Also a Deoxyribonuclease.